In this majestic full-length portrait, Marchesa Balbi sits frontally in a high-backed chair, her elegant, deep-green dress trimmed with gold brocade billowing around her. She gazes directly out at the viewer with disarming warmth, given the extraordinary sumptuousness of her costume. With one hand resting on her lap and the other dangling a fan against her dress, she seems relaxed and natural, and the portrait feels unexpectedly personal despite its large scale and imposing grandeur. Anthony van Dyck had a remarkable ability to understand his patrons' personalities and to reflect them in his portraiture. Although the precise identity of this young and attractive member of the Balbi family is not known, the Balbis were prominent members of the Genoese aristocracy. They commissioned a number of portraits from Van Dyck in the mid-1620s. His relationship with the Balbi family may even have preceded his trip to Italy, as a branch of the family lived in his hometown of Antwerp. 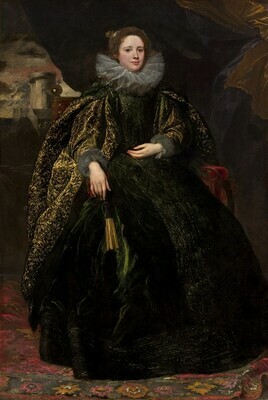 The grand, elegant style of this painting owes much to Van Dyck's one-time mentor Peter Paul Rubens, who had traveled to Genoa in the first decades of the 17th century and executed a number of imposing portraits, such as Marchesa Brigida Spinola Doria (also in the Gallery's collection). Van Dyck would have seen these portraits after he arrived in Genoa in 1621. Although Van Dyck was inspired by Rubens's portraits, he brought an entirely different expressive character to his own work. In this example, he has softened the architectural qualities of the Marchesa's costume and introduced elements of informality in her pose and in the undulating ripple in the oriental carpet beneath the her feet, further enhancing the portrait's engaging tenderness and candor. Balbi family Genoa, until 1819. Possibly Auguste de Sivry, Venice. Baron John Benjamin Heath [1790-1879, British consul at Genoa]; sold 1836, in London, to Robert Staynor Holford [1802-1892], Dorchester House, London; by inheritance to his son, Sir George Lindsay Holford, K.C.V.O. [1860-1926], Dorchester House; his estate; purchased February 1926 by (Duveen Brothers, Inc., London, New York, and Paris); purchased February 1926 by Andrew W. Mellon, Pittsburgh and Washington, D.C.; deeded 28 December 1934 to The A.W. Mellon Educational and Charitable Trust, Pittsburgh; gift 1937 to NGA. Giorgio Balbi (letter of 14 August 1958, in NGA curatorial files) wrote that he knew the painting was in the Palazzo Balbi until 1819. It was not certain when the painting was sold by the family, or by which member of the family. Michael Jaffé, in Bernhart Schwenk and Bettina-Martine Wolder, eds., Kunst in der Republik Genua 1528-1815, exh. cat., Schirn Kunsthalle, Frankfurt, 1992: 65-66, discusses some of the possibilities. Additional provenance information is suggested by Pietro Boccardo ("Ritratti di Genovesi di Rubens e di van Dyck: contesto e identificazioni," in Susan J. Barnes and Arthur K. Wheelock, Jr., eds., Van Dyck 350, Hanover and London, 1994: 88, 97 note 41), who notes that Giorgio Balbi, in his article "Fatti e misfatti di un palazzo Balbi," Genova (1958): 29 note 7, indicates that he owned a lithograph by P. Vogt, published by Barozzi in Venice, that depicts Marchesa Balbi. This lithograph identifies the owner of the painting as Auguste de Sivry in Venice ("M.me la marquise Balbi de Genes. L'original appartient à Monsieur Auguste de Sivry à Venise"). Although the date of the lithograph is not known, this information seems to indicate that the painting was sold by the Balbi family to Auguste de Sivry before it entered the collection of Baron Heath. Provenance prior to Mellon is according to Anthony van Dyck, exh. cat., National Gallery of Art, Washington, D.C., 1990: 144. Mellon purchase date and date deeded to trust is according to Mellon records in NGA curatorial files and David Finley's notebook donated to the National Gallery of Art in 1977, now in the Gallery Archives. Pictures by Italian, Spanish, Flemish, Dutch, and French Masters, British Institution, London, 1836, no. 103. Pictures by Italian, Spanish, Flemish, Dutch, French, and English Masters, British Institution, London, 1862, no. 35. Exhibition of the Works of the Old Masters. Winter Exhibition, Royal Academy of Arts, London, 1870, no. 26, as A Portrait. Exhibition of the Works of Sir Anthony Van Dyck, Grosvenor Gallery, London, 1887, no. 77, as The Marchesa Balbi of Genoa. Exhibition of Works by Van Dyck 1599-1641. Winter Exhibition, Royal Academy of Arts, London, 1900, no. 70. Second National Loan Exhibition: Woman and Child in Art, Grosvenor Gallery, London, 1913-1914, no. 100, repro. Anthony van Dyck, National Gallery of Art, Washington, D.C., 1990-1991, no. 24, color repro. Genova nell'età Barocca, Galleria Nazionale della Liguria (in the Palazzo Spinola di Pellicceria), Genoa, 1992, no. 169, repro. Kunst in der Republik Genua 1528-1815, Schirn Kunsthalle Frankfurt, 1992, no. 11, repro., as Bildnis einer vornehmen Genueserin. Van Dyck a Genova: Grande pittura e collezionismo, Palazzo Ducale, Genoa, 1997, no. 36, repro. Law, Ernest. "The Van Dyck Exhibition at the Royal Academy - II." The Magazine of Art (1900): 203, repro. (detail). Smith, John. A Catalogue Raisonné of the Works of the Most Eminent Dutch, Flemish and French Painters. 9 vols. London, 1829-1842: 9(1842):395, no. 96. Waagen, Gustav Friedrich. Treasures of Art in Great Britain: Being an Account of the Chief Collections of Paintings, Drawings, Sculptures, Illuminated Mss.. 3 vols. Translated by Elizabeth Rigby Eastlake. London, 1854: 2:200. Exhibition of Works by the Old Masters. Winter Exhibition. Exh. cat. Royal Academy of Arts, London, 1870: 5, no. 26. Guiffrey, Jules. Antoine van Dyck - sa vie et son oeuvre. Paris, 1882: 257, no. 365. Blaikie, J. A. "Van Dyck." The Magazine of Art 10 (1887): 200, 203-204, repro. (detail). Exhibition of the Works of Sir Anthony van Dyck. Exh. cat. Grosvenor Gallery, London, 1887: 71, no. 77. Phillips, Claude. "Correspondance d'Angleterre. Expositions rétrospectives de la Royal Academy et de la Grosvenor Gallery." Gazette des Beaux-Arts 35 (1887): 258. Manotti, Mario. "Ritratto di Antonio van Dyck." L'Arte 2 (1899): 254. Cust, Lionel. Anthony van Dyck. An Historical Study of His Life and Works. London, 1900: 42, 203, no. 77, 220, no. 70, 241, no. 65. Exhibition of Works by Van Dyck 1599-1641. Exh. cat. Royal Academy of Arts, London, 1900: 30, no. 70. Schaeffer, Emil. Van Dyck: des Meisters Gemälde. Klassiker der Kunst in Gesamtausgaben. Stuttgart, 1909: 20, 198, repro. Cust, Lionel. Anthony van Dyck - A Further Study by Lionel Cust.... New York and London, 1911: unpaginated, repro. Second National Loan Exhibtiion: Woman and Child in Art. Exh. cat. Grosvenor Gallery, London, 1913: 153-154, no. 100, repro. Glück, Gustav. Van Dyck: des Meisters Gemälde. Klassiker der Kunst in Gesamtausgaben 13. Revised 2nd ed. New York and Stuttgart, 1931: 196, 540, repro. Cortissoz, Royal. An Introduction to the Mellon Collection. Boston, 1937: 37-38. Duveen Brothers. Duveen Pictures in Public Collections of America. New York, 1941: no. 184, repro. Held, Julius S. "Masters of Northern Europe, 1430-1660 in the National Gallery." Art News 40, no. 8 (June 1941): , repro. Preliminary Catalogue of Paintings and Sculpture. National Gallery of Art, Washington, 1941: 204, no. 49. Reder, Jacob. The Portraits of the Brignole-Sale Family in the Palazzo Rosso in Genoa by Sir Anthony van Dyck. New York, 1941: 10, 14, 16, no. 13, repro. Book of Illustrations. National Gallery of Art, Washington, 1942: 240, repro. 41. Paintings and Sculpture from the Mellon Collection. National Gallery of Art, Washington, 1949 (reprinted 1953 and 1958): 70, repro. Cairns, Huntington, and John Walker, eds., Great Paintings from the National Gallery of Art. New York, 1952: 94, color repro. Walker, John. National Gallery of Art, Washington, D.C. New York, 1963 (reprinted 1964 in French, German, and Spanish): 310, repro. Summary Catalogue of European Paintings and Sculpture. National Gallery of Art, Washington, 1965: 46. Cairns, Huntington, and John Walker, eds. A Pageant of Painting from the National Gallery of Art. 2 vols. New York, 1966: 2:276, color repro. European Paintings and Sculpture, Illustrations. National Gallery of Art, Washington, 1968: 39, repro. European Paintings: An Illustrated Summary Catalogue. National Gallery of Art, Washington, 1975: 118, repro. Walker, John. National Gallery of Art, Washington. Rev. ed. New York, 1984: 263, no. 336, color repro. European Paintings: An Illustrated Catalogue. National Gallery of Art, Washington, 1985: 143, repro. Kopper, Philip. America's National Gallery of Art: A Gift to the Nation. New York, 1991: 101, color repro. Banu, Georges. Le Rideau ou la fêlure du monde, Paris, 1997, p. 29, repro. Wheelock, Arthur K., Jr. Flemish Paintings of the Seventeenth Century. The Collections of the National Gallery of Art Systematic Catalogue. Washington, D.C., 2005: 53-56, color repro.